Arena Financing Privately by Nationwide Insurance Enterprise and the Dispatch Printing Company. One of the most beautiful and unique sports and entertainment venues in the world, Nationwide Arena opened its doors in September 2000 with the nation's only two-night performance of the sold-out "Soul to Soul" tour featuring Tim McGraw and Faith Hill. Nationwide Arena is the home of the National Hockey League's Columbus Blue Jackets, the National Lacrosse League's Columbus Landsharks and a wide variety of world-class entertainment events. Nationwide Arena is the only building in the Hockey League that has the team's practice facility, CoreComm Ice Haus, attached to the arena where the team plays its games. The CoreComm Ice Haus is not only the practice home of the team, but is open to the public as well. Nationwide Arena is the centerpiece of the Arena District, Columbus' newest entertainment area. This trendy section of downtown development is a unique mixture of business, entertainment and residential space that attracts a broad spectrum of tenants and visitors from across the country. There is no place in the world that a true Blue Jackets fan would rather be than inside Nationwide Arena on the night of a game. From the moment one walks in the door, it is apparent that the builders designed Nationwide Arena with the Blue Jackets fan in mind. Aside from presenting a wide variety of concerts year-round, and professional Lacrosse games as well, Nationwide Arena is making a name for itself as one of the best NHL arenas in existence. Its spaciousness awes you from the moment you walk in, to the moment you leave. Instead of packing into tiny corridors between periods, fans at Nationwide Arena can mingle with friends in a three-story, wide open atrium which runs the length of the building along one side. They can look through a set of glass windows onto the ice in the CoreComm Ice Haus, where the Blue Jackets practice on-site, and which is open for public skating much of the time. Or they can sample a variety of foods ranging from the famous local Donato's Pizza, to barbequed pulled pork sandwhiches, right down to your plain old hot dog. Beer is available in bottles or on draft, and can be purchased from vendors which roam the aisles during play as well. From the front row, to the Bud Light Party Terrace high above the rink, there is not a bad seat in the arena. The chairs are all comfortable with good sightlines. However, don't get too comfortable in your seat, as the action of the ice is sure to have you on your feet and cheering wildly. Columbus supports its teams. The Blue Jackets are no exception. With a great arena to play in, and great fans to back them up, the Blue Jackets should look forward to many years of NHL hockey right here in Columbus, OH. Inspired by the game. The city. And the fans. This is more than an arena. It's a source of pride for the Blue Jackets. And for you. The steel and brick represent strength and stability. The abundance of glass pays tribute to the vision that made this arena a reality. And the tower of light is a signal to everyone that the team, city, and fans have arrived. In many ways, this arena was a logical next step. For Nationwide� Insurance and for Columbus. As any resident of this city knows, Nationwide� has always stepped to the front. In support of the arts. Education. And countless community endeavors. The Nationwide ArenaSM is the latest example of a corporate citizen and a city moving forward together. "The Nationwide ArenaSM will be a catalyst for additional, exciting development in downtown Columbus. It will be a home for world-class entertainment and convention facilities - something for everyone in this wonderful community. Your purchase of a personal seat license will help to ensure that you can be a part of this exciting future." The arena is a catalyst. For growth. For development. For renovation. Restaurants, shops, galleries, businesses. They will surround the arena on all sides. And spread out in all directions. Along with Miranova and COSI, Nationwide ArenaSM will anchor the development that transforms the Scioto River Peninsula into downtown's most dynamic setting. Where pedestrian walkways, bridges and parks will lead to an eclectic collection of entertainment, dining and shopping options. Throughout the entire riverfront corridor. Concerts. Shows. Exhibitions. The circus. The Nationwide ArenaSM will be home to more than the Columbus Blue Jackets. In fact, this facility will serve as a regional entertainment hub. And will allow us to attract many events to Columbus for the first time. This arena was made for you. All 700,000 square feet of it. Incredible sight-lines to view the action. From every one of the 18,500 seats. With wide concourses that make it easy to get from point A to point B. Like from your seat to a concessions area, for example. Where you'll find an upscale offering to satisfy every taste. We've even made it easy to get your hands on all the Blue Jackets merchandise. There's a team shop right inside the arena. And if you ever feel like hitting the ice yourself, the Chiller will be right next door. 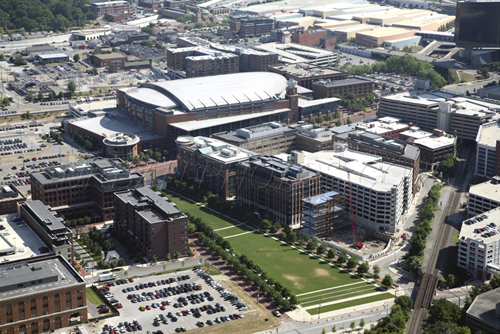 The Arena District plans to be a unique urban village of housing, retail and office space under development in the area adjacent to Nationwide Arena. Nationwide is currently working on the infrastructure needed to support development in the area. Construction on the Arena Park is already underway and will be completed by late October 1999. East and West Streets, bordering the park, were completed in September 1999. In addition, Nationwide Boulevard, between Front Street and Neil Avenue will be completed by the end of November 1999. * Nationwide Boulevard will be repaved in brick. It will be the backbone of the district, lined with restraurants, shops and cafes. * Arena Square, being developed at the west entrance to Nationwide Arena, will serve as a gathering place surrounded by restraunts and clubs. Planners envision special lighting, video boards and large signs to create a mini Times Square on the Scioto atmosphere. * Arena Park is a grass mallway 870 feet long and 280 feet wide at its widest part. The park's south end will have large grass terraces leading down to the Scioto riverfront. Its north end features the relocated Union Station Arch, designed by famed architect Daniel Burnham. * Clusters of brick, upscale apartments will be built west of Arena Park. A total of 350 units, built on the former Ohio Penitentiary site, will include views of the river and park. * 200,000 square feet of retail/entertainment development around Arena Square at the corner of Nationwide Boulevard and West Street. * 1.3 million square feet of office space, with most of it West and South of Nationwide Arena. * A total of six parking garages, providing ample space allow people to park their cars and experience the Arena and Arena District. * Arena Size: 685,000 square feet. * Total Project Size: 800,000 square feet; includes practice rink, office building, and retail space. * Seating Capacity: 18,138 for hockey; 19,500 for basketball; approximately 20,000 for concerts. * Premium Seating: 3,200 premium seats available (including Club, Suite, Tower, Skybox, and Center Ice configurations). * Parking Spaces: 560-space attached parking garage, with an additional 10,000 spaces within a 10-minute walk. * Architects: Heinlein + Schrock, Inc., Kansas City, Mo. ; and NBBJ of Columbus. Construction Managers: Turner/Barton Malow Sports, Miles-McClellan Construction Co. * Unique Features: Separate practice rink, which will be open to the public for skating and viewing. Signature restaurant of 7,500-10,000 square feet. Attached retail shops, restaurants, and office space. * Excavation will remove 100,000 cubic yards of dirt from the arena site. This equals the amount of dirt displaced excavating basements for 116 homes (average home size of 2,000 square feet). * Nationwide Arena will require 36,000 cubic yards of concrete to complete construction. This is enough concrete to build basement walls for 732 homes (average home size of 2,000 square feet). * The arena will require 5,200 tons of reinforced steel. If stretched in a continuous line of 1/2-inch pipe, this amount of steel would be 2,963 miles long -- about the distance from Columbus to Seattle, Wash.
* Nationwide Arena will use 6,400 tons of structural steel. This equals the amount of structural steel used to make 8,600 cars. * The Blue Jackets' practice rink, which will also be open for public skating. * A four-story, 60,000-square-foot office building, with some office views to the arena interior, on its northeast side. * Two 80-foot towers to anchor the west end of the arena. The towers will house four platforms for luxury seating and will be topped with huge video boards. * An asymmetrical bowl, with telescopic upper deck seating in the west end, which will allow for a variety of reconfigurations for concerts and other performances. * A 70-foot, glass-enclosed atrium, open lobbies and concourses to allow visitors to immediately feel part of the action. * Uniquely-designed seating will provide superior sight lines throughout and 76 luxury suites and 22 loge boxes will provide additional amenities. Privately financed and developed by Nationwide Insurance Enterprise and the Dispatch Printing Company. In addition to serving as the home of the Blue Jackets, Nationwide Arena will host a variety of family entertainment including concerts, ice shows, and other sporting events. The arena is designed as a mixed-use facility that will integrate into its downtown surroundings. A pedestrian-friendly building, the arena's west, east and south sides will house street-level shops and restaurants. A Blue Jackets team store will anchor the southeast corner. The red brick arena exterior will allow the structure to blend with the existing turn-of-the-century architecture of its neighbors. A 135-foot light tower will add illumination to the downtown sky. (West side of the Arena District) Proceed South on I-71 to I-670 West to the High St. Exit (the orange sign says “Convention Center Only”). Then turn LEFT at the stop sign. You will then follow the CFA Roadway which turns into Kilbourne take that until you come to the stop sign at the corner of Kilbourne and Vine (about a half block down). Turn left onto Vine then go to Neil and turn left again. Proceed West on I-70 to the Fourth St. Exit. Continue West on Fulton St. to Front St. Make a Right at Front St. and proceed North. Proceed North on Front St. to Event Parking Entrances. SR-315 traffic coming from the west may access the Arena District via Neil Avenue (as usual). If you would normally take I-670 from 315 N. and exit 3rd, you should now exit Neil Avenue and turn right go to Nationwide Boulevard and turn left to access the East side of the Arena District. Proceed West on I-670 to the Third St. Exit. Proceed South on Third St. to Chestnut St. Make Right at Chestnut St. and proceed to the Event Parking Entrances. November 5, 2000 & January 20, 2003 - For 20 years Columbus tried to land themselves a pro hockey team, and again and again, the public sector refused to kick in. So finally a consortium of private moneys was put together to build their new hockey arena, and the NHL rewarded Columbus with an expansion team, and play began in 2000. And what a splendid new hockey arena it is! The arena is situated on the north side of downtown Columbus, and signage off of I-670 or I-71 will direct you right to the Arena District. From I-71 the Spring St exit is your best bet. Parking around the arena is abundant, with the lot directly across from Arena Square running $15, but most lots in any direction run $5 or $7. Nationwide Arena is the anchor building for what has already become the "Arena District". We walked about 4 blocks from our parking lot to the arena, and every building we passed was either open for business or in the process of being gutted and refurbished. The main street, Nationwide Blvd, has being repaved in brick, and the main entrance to the arena spills out into Arena Square, which serves as a gathering place surrounded by restaurants and entertainment in a "Times Square" type setting. Across the street is a parking ramp, emblazoned with a huge "Arena District" marquee, a massive Daktronics video board and a series of changeable ad panels. On our second visit, we counted at least a dozen restaurants and bistros just steps from the front door, all great places to visit before and after the game. The management took tours of many NHL venues to cull great ideas for their project - and from our travels we can detect similarities to other NHL venues - a light tower and beacon is reminiscent of Nashville's Gaylord Entertainment Center; the center ice scoreboard is designed similar to the one at Air Canada Centre; a stack of "party suites" four high in two corners looks alot like the suites at Philips Arena; and their grand entrance pavilion with its sweeping views of downtown Columbus is reminiscent of our own HSBC Arena. This facility almost has the feel of the Conseco Fieldhouse which we had just seen - at the top of the bowl there are huge glass walls allowing light into the building, and the entire building has a red brick and stone veneer giving the place a nostalgic feel to it. Once inside, you enter a huge pavilion with glass walls facing outside and escalators to take you to club or upper levels. A team store is right inside the pavilion. All the concourses are bathed in soft lighting and some corridors in blue mood lighting to accentuate the "blue" theme in Blue Jackets. The concessions are organized by themed geography, with such names as "sunset", "uptown", "west end" etc. The corridors are also given corporate nicknames, for example "CoreComm Avenue" on the upper deck. At the main pavilion one can find the main food venue with a huge food court, several bars, all grouped into an area called "Bud Light Terrace". This arena is laid out much like our own in Buffalo, with a club level wrapping around 75% of the 200 level, and premium restaurants up there laid out much like our 200 level Harbour Club. Interestingly, they also have 2 "super premium" areas - one side of the 200 level sidelines has mini-boxes, with huge captains chairs and their own TV monitors, and there are also high tables - 4 to a table that are sold by the table for viewing the action - these tables also come with TV monitors. In the first few rows around the penalty boxes is another exclusive premium area, with access to a private club called the "ticketmaster.com lounge" and an upscale buffet. This bowl is beautiful -and when you walk around the 100 level concourse you can actually see the action from the concourse itself. But the coolest thing is the latest in LED Surround Vision Technology. This dot matrix board is bolted on the facade of the upper deck and forms a continuous circle around the inside of the arena. Just like Paul Brown Stadium, this board can display advertisments with neat graphics, stats, and also great special effects in with an IMAX surround type effect. ABSOLUTELY TERRIFIC!!!!!! The Blue Jackets have a practice rink built right into the arena - not next door..not adjacent - right in the arena!!! It is called the CoreComm Ice Haus, and you can see it at one endzone from the 100 concourse by looking through the glass. There is bench seating for about 1000 patrons, and there is also a restaurant overlooking the playing surface. The practices are open to the public and the building is also used by the public and youth teams, sometimes even when the Blue Jackets game is in progress. The team has sold almost 13,000 season tickets, and that is incredible considering that the city has almost no hockey tradition (save an ECHL championship by the former Columbus Chill, coached by our own Brian McCutcheon! ), and also there is a PSL requirement which doesn't go to the team but rather to defray the cost of construction. We think that the fan support is remarkable... and this city has gone nuts for their new NHL team... what a great addition to the NHL family! No past teams - no tradition.. so they hang banners of some "founding" corporate sponsors. Definite deduction in our book. The titles will come, the championships will come, and someday this team will bid farewell to its icons and retire their numbers.. Until then, LEAVE THE RAFTERS EMPTY. Hat Trick - The digital LED 360 degree surround dot matrix board is very cool. The set up here in Columbus actually goes about 80% of the way around, nonetheless, they use it to the max and it really dresses up the seating bowl. Hat Trick - to the management of the Columbus Blue Jackets. Too many people to list here, but special props to Joel Siegman, Fan Services Coordinator. We hooked up with Joel on both of our visits, and he was very gracious to us. On our return visit, Joel lined up VIP seats, gifts of personalized jerseys, media appearances, and participation in in-game entertainment. A big THANK YOU to the number one NHL organization in our hearts! Penalty - to Andrew, who with Peter was invited to shoot t-shirts into the crowd with one of those big cannons. He sailed the last shirt right onto the ice, almost hitting 'Jackets goalie Marc Denis. OOPS! Fortunately the puck hadn't dropped yet. Andrew will report back to Columbus to serve the penalty in person. Assist - A large "Fans #1" banner hangs at the top of the escalator in the main atrium. THIS is an appropriate place for this sort of banner, and we are glad the Blue Jackets resisted the temptation to hang this in the seating bowl. Columbus did it right... a privately built arena with a dynamic cityscape built around it. Attractions both at the arena and throughout the adjoining neighborhood to keep people coming on event days and at other times. A wonderful building abounding in fan amenities, food selections, and other entertainment. The first in the NHL auxiliary practice rink built right in the arena, available for public use as well. It all works here - the team, the building, the Arena District. Clearly this is one of the premiere, if not THE best, setup in the NHL. Cities looking to build a sports venue and companion private development to create vibrant urban synergies need look no farther than Columbus to see how it should be done. Congratulations to you, Columbus... you have set the bar for your peers to emulate! We hope to come visit again and again. Columbus, Ohio - The Columbus Blue Jackets' sought to sell Nationwide Arena to the county in hopes of ending deficits and avoiding a move to another city barely got out of the gate. Opposition from the county and area legislators has essentially stopped the effort. Team officials say they have lost $80 million over the past seven years in the 18,000-seat building and they aren't making as much revenue from their arena as other NHL team despite good tickets and sponsorship sales. For example, Nationwide owns the building and does not pay for naming rights. If the building were sold to the county, that would allow the lease to be rewritten. Nationwide Realty Investors has suspended rent payments for the team for the 2008-09 season. The hope was that Franklin County commissioners would agree to impose tax increases on beer, wine, liquor and cigarettes to fund the purchase of the arena. The new plan, modeled after a tax plan used to build a baseball stadium and arena in Cleveland, comes 12 years after Franklin County voters rejected a temporary tax increase to pay for a new Downtown arena. Nationwide Arena has a 99 percent property-tax abatement, but it provides at least $1 million a year to the school district from a surcharge on ticket sales and a portion of arena employees' city income tax. If Franklin County became the arena's owner, it would be responsible for continuing to pay the Columbus district. Under the plan, Nationwide would use whatever profits it gains from selling the arena to purchase a minority ownership of the team. State help would be needed and the financing plan has been attacked by the liquor industry because of the price increases. The legislative plan would allow Franklin County commissioners to raise taxes by 28 cents on a 12-pack of beer, 6.4 cents on a bottle on wine, 60 cents on a fifth for spirits and 4.5 cents per pack of cigarettes. Either the county or the Convention Facility Authority could use the proceeds to purchase the arena, which would still be named Nationwide Arena, but the company would pay for naming rights. Nationwide officials say they haven't formally signed off on the plan, but were supportive of the discussion. Columbus, Ohio - A decade ago, a 75-acre area along the Scioto River less than a mile west of downtown was an industrial no man's land, consisting of barren rail yards, old warehouses and a shuttered 19th-century penitentiary. But that was before Nationwide Realty Investors, an affiliate of Nationwide Mutual Insurance, turned the area into the Arena District. The district, a $750 million mixed-use neighborhood of housing, offices, retailing and entertainment, has attracted some of the city's most prominent architecture, law, real estate development and advertising firms and is regarded as one of the Midwest's most successful urban redevelopment projects. Late in October, the Columbus City Council approved the development plan for the Arena District's final phase: a $250 million project to add 450 units of housing, 300,000 square feet of office space in two buildings, an 80,000-square-foot grocery store, an eight-level garage with 1,600 spaces and as much as 40,000 square feet of retail space. As for the financial crisis that has gripped the credit markets, Brian J. Ellis, the president and chief operating officer of Nationwide Realty Investors, noted that in the 11-year history of the Arena District's development, the company had contended with what he called "down cycles." Though the current crisis is more severe than the others, Ellis said, the company's strategy is to "build with the market." "What's happening now may affect the speed at which we complete this final phase," he said. "But we continue to see strong demand for the office space and housing. We continue to command the highest rental rates in the city." Indeed, at annual leasing prices of roughly $25 a square foot - compared with about $20 downtown - 97 percent of the 1.4 million square feet of office space is occupied in the Arena District's three- and four-story brick buildings. Their design pays homage to the old warehouses and factories that once stood here. They now house some 5,000 workers, including more than 100 employees of SBC Advertising, a top Midwest firm, which leased 30,000 square feet in the district's newest office building. About 1,000 people live in the 525 housing units in the Arena District, and much of it is leased or sold. This includes North Bank Park, a 20-story condominium building along the river with striking views of downtown, which Nationwide completed in December 2007. The two-bedroom two-bath units sell for $350,000 to $1 million, and nearly 50 percent of 88 units have been sold. Thousands of people from outside the area regularly attend games of the Columbus Blue Jackets of the National Hockey League in the 18,500-seat Nationwide Arena, which was the catalyst for this redevelopment, and they spend time before and after the hockey games and other events in 14 restaurants and bars in the district. The area also includes McFerson Commons, a pocket park that connects to the Scioto Mile, a $39 million promenade and riverfront park that the city started to build this year. Nationwide is also developing Huntington Park, the new 10,000-seat baseball field for the Columbus Clippers, a Triple-A franchise of the Cleveland Indians. The $50 million ballpark is owned by Franklin County and is to open next spring. Nationwide Realty helped Columbus envision a new approach to land use. The Arena District, a partnership between the city and the company, which has developed almost everything in the decade-old district, was to be an answer to Columbus's downtown woes. It seems to be succeeding. The mixed-use district embodies three influential theories of urban redevelopment of the last decade: energetic and walkable street and neighborhood designs, as advocated by prominent architects who call themselves "new urbanists"; urban settings that let creative young professionals weave work and play, as advanced in the writing of Richard Florida; and sports venues, which some experts see as essential to civic economic health. The Arena District's popularity has prompted Mayor Michael B. Coleman to accelerate a plan for the city's depopulated downtown that he introduced in 2002. Four years after it closed as a historic department store, the 1-million-square-foot Lazarus building reopened in 2007 as an office building. Nearly 2,000 people work there, and it has spurred housing development. About 4,700 people have moved downtown into almost 4,000 units of housing built since 2000, and 1,000 more units have been approved for construction. Coleman said his target was to attract 10,000 people to live downtown, and in March he committed to spend $20 million to develop 86 miles of bike paths and lanes, with both to be completed by 2012. Columbus, Ohio - A report issued by the Columbus Chamber of Commerce says the Columbus Blue Jackets could leave Nationwide Arena and the city unless a way is found to help the team generate more revenue. The report says the team is losing about $12 million a year. The team is an important part of the city's arena district, a section of the city that hosts not only the arena, but a variety of other entertainment offerings. The district generated $30 million in tax revenues last year. The Chamber said the goal is a financial package that would relieve the Blue Jackets of significant costs, potentially including $5 million a year in arena rent and $4 million in operational losses. The Chamber does not see the issue going before a public vote, but getting its support from local and state officials. Two of the three county commissioners say they won't support any plan that doesn't allow an election. Voters had repeatedly rejected using tax dollars to build an arena when a local business partnership stepped up to build Nationwide Arena. Nationwide owns 90 percent of the arena, and The Dispatch Printing Company, owner of The Dispatch, 10 percent. JMAC/Worthington Industries owns about 80 percent of the team, with the remainder owned by a Dispatch Printing Company subsidiary, real-estate developer Ron Pizzuti, Crane Plastics and former Columbus Chill owner Horn Chen. The Chamber's plan calls for the state, which is projected to get nearly $30 million a year in taxes by 2018, to share some of that wealth by providing capital-improvement dollars to operate the arena. There are also refinancing options, including issuing tax-exempt bonds or asking for federal stimulus dollars. Other options include increasing taxes on alcohol and tobacco products, car leasing or hotel stays. The Blue Jackets pay rent to the owners of the arena. Under the lease, the Jackets can rent the arena for concerts and events, but that business is losing money, the report said. If the Blue Jackets had free rent and arena-naming rights, the hockey operations would basically be breaking even, but the other business of booking concerts and events would still lose about $4 million a year. Nationwide Arena competes for concerts and other events with venues run by Ohio State University, Franklin County and the Convention Facilities Authority. Even if Nationwide Arena attracted every concert, the central Ohio market is not big enough to cover expenses, according to the report. An attempt to get Franklin County to buy the arena stalled last summer. The team had tried to persuade Ohio lawmakers to amend the state budget bill to allow a countywide "sin tax" on alcohol and cigarettes. The proposed deal called for Franklin County to pay $65 million for the facility, the report said. In 2003, Nationwide argued before the Franklin County Board of Revision in a property-tax case that the arena was worth no more than $46.5 million. Columbus, Ohio - Political leaders say they want to help the Columbus Blue Jackets survive their economic woes, but they won't use tax money to do it. Arena owner Nationwide Insurance said it already has allowed the team to defer rent payments for the past two seasons. "Nationwide is willing to be part of the solution, but we cannot do it alone," said Brian Ellis, president of Nationwide Realty Investors, the insurance company's real-estate arm. "This is a complicated problem that will take time, and it will require some form of public-private partnership to solve." A Chamber of Commerce study by Stephen A. Buser, a professor emeritus of finance at Ohio State University, pegged team losses at $12 million a year. But, he said, the entertainment district around the arena supports about 5,500 jobs and generated $29.6 million in 2008 taxes. City Council President Michael C. Mentel said public involvement doesn't necessarily mean public money. The report also suggested issuing bonds, offering tax incentives or creating special taxing districts. Councilman Andrew J. Ginther said a public-private partnership "is not just public: The private sector is going to have to sacrifice and make some choices. The public is going to have to get something out of this, either through the team or the arena." Chamber President and CEO Ty Marsh said officials want a solution by year's end to relieve the Blue Jackets of significant costs, including $5 million a year in arena rent and $4 million in operational losses. 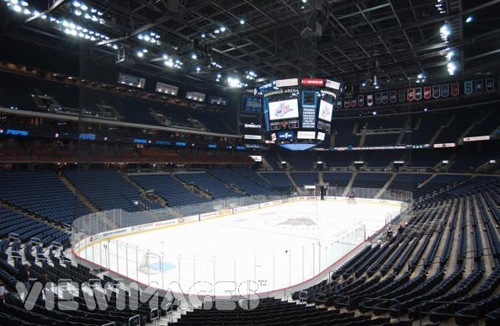 Columbus, Ohio - Talks over how to help the Columbus Blue Jackets to become a viable operation in Nationwide Arena have stalled as the parties work to figure out what issues need to be resolved. The current round of talks will probably will end without an attempt to negotiate with all parties - team owners; Nationwide, the majority owner of Nationwide Arena; and elected officials - at the table, said Bill Jennison, executive director of the Franklin County Convention Facilities Authority. "There is no sense in bringing everybody into a large room," Jennison said. "It has to be productive." In November, the Columbus Chamber released a study that said the Blue Jackets might leave the city unless a financial fix is found to overcome an estimated $12 million-a-year shortfall. The report said the team was suffering because of an unfavorable lease, and Chamber President Ty D. Marsh said the issue needed to be resolved by the end of December. "That obviously didn't happen," Jennison said. "This is a really complicated real-estate transaction, in addition to everything else." An attempt to get Franklin County to buy the arena stalled in the summer. The team had tried to persuade Ohio legislators to amend the state budget bill to allow a countywide "sin tax" on alcohol and cigarettes. Franklin County Administrator Don Brown said he has received a couple of progress reports, but Brown wouldn't comment on what they said. The November study, prepared for the chamber by retired Ohio State University finance professor Stephen A. Buser, outlined alternatives for subsidizing the team, including asking the state for capital-improvement money, issuing tax-exempt bonds or asking for federal stimulus money. Other options included increasing taxes on alcohol and tobacco products, car leasing or hotel stays. Voters had repeatedly rejected using tax revenue to build an arena when a local business partnership stepped up to build Nationwide Arena, which opened in 2000. Columbus, Ohio - Columbus Mayor Michael B. Coleman said in a radio talk show interview that the city might take over ownership of Nationwide Arena. Community groups have been working on ways they might help the finances of the NHL Blue Jackets, the venue's primary tenant. The Blue Jackets' $5 million annual rent for Nationwide Arena and $4 million annual loss to run it are the biggest factors in the team's finances, according to a report made in November for the Columbus Chamber. The report said losing the NHL franchise would devastate the Arena District. "Ultimately, it's going to require the Convention Facilities Authority to step into the arena side of the management," Coleman said. About an arena-Schottenstein Center partnership, he said: "They're great facilities. I love them both. If there's some way they can work together ... it will help the situation substantially." Columbus, Ohio - A solution to the financial challenges facing the Columbus Blue Jackets could include turning over management of Nationwide Arena to Ohio State University. The school already owns and operates the Schottenstein Center which it manages with its own staff. Under an agreement that OSU and Blue Jackets officials said could be finalized within two weeks, the university would manage both arenas and handle bookings for concerts and other events. That would save at least $1 million annually for each side because of lower administrative costs and better leverage in booking. Currently, the Blue Jackets rent Nationwide Arena from the Nationwide insurance company and other owners for $5 million a year. The team pays a management company to run the venue and has said it loses $4 million a year on its operation. The team's total deficit runs about $12 million annually. "This could be an important step, but it represents only about a 10 percent fix to our problem," Blue Jackets President Mike Priest said. "If we have a $12 million problem and we fix it by $1 million, that's at least a step in the right direction." * Nationwide Arena could become the property of the Franklin County Convention Facilities Authority, a public agency. The new owner would not charge the Blue Jackets rent. * Nationwide could cut its asking price for the arena and could pay for naming rights. * Public money could come from several potential sources, including the taxes to be paid by Ohio's newly approved casinos or through another attempt to impose a rental-car tax that Columbus voters rejected in 2002. The last option could face an electoral hurdle because the city charter says ordinances rejected by voters can't be reimposed without their approval. City Attorney Richard C. Pfeiffer Jr. said that appears to require another vote, even if the tax would be at a different rate. Brian Ellis, president of Nationwide Realty Investors, said he supports the emerging relationship between OSU and the Blue Jackets. The management deal is on a fast track because the team's contract with SMG, a Pennsylvania-based company that runs Nationwide Arena, expires on June 30. Xen Riggs, an OSU associate vice president in administration and planning, said the contract would be for a year but likely wouldn't last that long. Ohio State's management of Nationwide Arena would essentially represent a partnership between the school and the Blue Jackets, Riggs said. "We wouldn't characterize this as an OSU takeover," he said. "It simply made sense for us to get involved since we manage a similar 20,000-seat arena." Columbus, Ohio - Ohio State University officials have agreed to terms for managing Nationwide Arena, home of the NHL Bluejackets, but say they won't release details until university lawyers complete their review. The agreement would run through June 30, 2011. The school already manages its own arena, the Schottenstein Center. The move was made in an effort to help the Bluejackets financially. Other elements of a solution could be months away. Currently, the Blue Jackets rent Nationwide Arena from the Nationwide insurance company and other owners for $5 million a year. The team pays SMG, a Pennsylvania-based management company, to run the venue. The co-management deal was on a fast track because the team's contract with SMG, which has run the arena since the facility opened in 2000, expires June 30. "I'm hopeful it serves as a catalyst for further progress," said Blue Jackets President Mike Priest. "Yes, it's a step in the right direction." Under the agreement, the university, which already runs the Schottenstein Center, will handle bookings for concerts and other events at both arenas. Ohio State won't start co-managing Nationwide Arena until July 1, but it started scheduling and booking acts this week. The university won't book sporting events for Nationwide. Officials said the deal would save the Blue Jackets about $1 million annually because of lower administrative costs, efficiency savings and better leverage in booking because the two facilities won't be bidding against each other. By working together as co-promoters, the two facilities can spend more time marketing so they can attract a larger audience and make more money in sponsorships and suite revenue, OSU officials said. Officials said, tour agents were pitting the two area venues against each other, sometimes wringing out as much as $100,000 to $200,000 from the winning venue to secure a show. Those costs, in turn, were heaped on fans. The co-management deal was forged amid discussions of how to help the Blue Jackets, which have been losing about $12 million annually, according to team officials. Columbus, Ohio - Two years after the Columbus Blue Jackets floated the idea of a public purchase of Nationwide Arena, no one has agreed on a way to help the hockey team stem its financial losses, the Columbus Dispatch said. City and county officials haven't met about the issue since October, despite initial suggestions that a solution was urgently needed, the newspaper reported. "The dialogue is in a state of pause," John Rosenberger, a lawyer hired by the city of Columbus and the Franklin County Convention Facilities Authority in 2009 to negotiate a deal, told the Dispatch. That pause accompanies uncertainty about the state budget and whether tax revenue from a casino could be part of a solution. The casino developer has sued the city and county in a case that could decide how much tax revenue Columbus receives from the project. 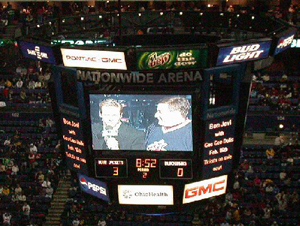 In May 2009, the Blue Jackets announced that the team had lost about $80 million over the past seven years, mostly because of its lease deal with the arena owners. Last year, the team said its deficit runs about $12 million per year. The newspaper quoted unidentified NHL sources saying the team lost $25 million in the most recent season. The team proposed a solution in which the Franklin County Convention Facilities Authority would purchase the arena. The team could shed its $5 million rental fee and about $4 million in losses from operating the arena. Nationwide Insurance, which as the majority owner of the arena now pays no naming fee, would begin to make payments. "We're not commenting at all to the media on the situation," Todd Sharrock, the team's vice president for public relations, told the Dispatch. The team's last proposal regarding a public purchase, in July, involved committing tax revenue from a Columbus casino. "I think it is the most-viable solution, and it wouldn't require any other money being used," Blue Jackets president Mike Priest said at the time. "But it's up to the public sector to decide how it wants to use that money." Projections say Columbus and Franklin County each would receive $16 million in casino taxes, and the city could collect another $8 million if it is the "host city" to the casino project. But developer Penn National Gaming plans to build the project in Franklin Township. The question of whether Penn can build in Franklin Township is part of two lawsuits involving the casino. Mayor Michael Coleman told the Dispatch that he and the county officials talked about using casino money to help finance purchasing the arena, but he said that wasn't the only potential use for the money. "Nothing is settled. Let's be clear about that," Coleman said. "The uses for the casino money range from police and fire, fighting gambling addiction, social services, the arts and blight issues." Coleman has ruled out using city income taxes from its general fund to purchase the arena, but he has been open to other options. Decisions on spending any casino tax revenue will have to wait until the revenue is available, he said: "We wouldn't look at it until we know it's there." Columbus, Ohio - Ohio State University has extended its contract to manage Nationwide Arena, a deal that both sides say has saved them more money than expected, the Columbus Dispatch reported. "The bottom line is that we ended the year $1 million ahead (at the Schottenstein Center), which is a million more than we projected," said Xen Riggs, an OSU associate vice president. The co-management deal was designed to help the Columbus Blue Jackets, which have been struggling with financial problems related to their lease at Nationwide. The deal comes as a new plan emerged to help support the Blue Jackets with revenues from a new casino. Sources told the Dispatch, that a portion of the revenues generated by the Hollywood Casino Columbus on the West Side will be used to help the Blue Jackets. No exact dollar figures have been decided. Mayor Michael B. Coleman told the Dispatch he is "considering casino revenues. Having said that, there is no fix yet. That's as far as I can go right now, but it's high on my agenda to deal with it. There should be an urgency to this issue." City Council President Andrew Ginther agreed that "failure is not an option. We will figure this out. We will find a resolution." The casino is expected to generate roughly $24 million per year for the city and about $16 million per year for Franklin County, money that could be allocated for the Blue Jackets without a public vote. A source close to the negotiations told the Dispatch "less than half" of the revenue generated by taxes on the casino would be used to ease the financial burden caused by the arena lease. Because Nationwide Arena was privately funded the Blue Jackets do not draw revenue from naming rights, parking and luxury suites at the same rate as other NHL clubs. The Blue Jackets lost nearly $25 million in the 2010-11 season, according to the Dispatch's sources, and have lost roughly $53 million combined during the past three seasons. Of that total, the Blue Jackets said, between $10 million and $12 million per year is directly the result of their lease agreement. When Ohio State and Nationwide began the management agreement in May 2010, the Blue Jackets projected savings of $1 million and Ohio State hoped for $250,000 based on lower administrative costs and efficiencies. Blue Jackets President Mike Priest told the newspaper the team reached its goals of cutting operational costs and increasing attendance at events at Nationwide Arena, but he wouldn't provide financial details. Nationwide Arena is majority owned by Nationwide Insurance. The Dispatch Printing Company holds a 10 percent stake. The one-year extension makes Ohio State the manager of both arenas through July 1, 2012. By relieving the hockey team from some of the operational costs of running the arena, it can focus on finding a long-term solution to its annual $12 million deficit, Riggs said. Currently, the team rents Nationwide for $5 million a year. Before the partnership with Ohio State, the team paid SMG, a Pennsylvania-based management company, to run the venue. The Blue Jackets do not pay Ohio State a management fee. In the past year, the total revenue for the Schottenstein Center dropped $851,784. But because the center cut $840,367 in expenses, it still ended the fiscal year on June 30 with more than $1 million in net operating income, according to financial statements. Although the state contributed $15 million toward building the Schottenstein, the center is supposed to break even on its operations without any subsidy from tax dollars or the university, Riggs said. In the past five years, the Schottenstein center has netted $366,865 to slightly more than $1 million in operating income per year. Most of the net income is put into a reserve fund, which currently has about $7 million, to pay for major capital expenses. "It's a very volatile business that can be up, down and all over the place, depending on the number and types of acts that are booked, attendance numbers and how much is made in food, beverage and merchandise sales," Riggs said. The beauty of the contract, Riggs said, is that it makes it possible for the two buildings to cross-promote rather than compete for events. The venues also are able to sign acts that they likely would have to turn down without the partnership, Riggs said. Columbus, Ohio - Using casino tax revenue to finance the $42.5 million public purchase of Nationwide Arena would save thousands of jobs and keep the Blue Jackets in Columbus, the architects of the proposed deal told the Columbus Dispatch. "My motivation is economic development," Columbus City Auditor Hugh J. Dorrian told the Dispatch. "We're not talking about a few jobs; we're talking about thousands of jobs." Dorrian, Columbus lawyer John Rosenberger and Bill Jennison, executive director of the Franklin County Convention Facilities Authority, rolled out a plan that has been two years in the making. It would move the arena from an ownership group led by Nationwide and into the hands of the facilities authority. Nationwide would invest more than $52 million in the Blue Jackets, becoming a 30 percent owner of the team, and buy naming rights to the arena. The hockey team would agree to remain in Columbus through 2039. The deal also would place in public hands an arena that voters declined to fund with higher taxes in 1997. Instead, Nationwide and The Dispatch Printing Company financed the arena, which opened in 2000. Dorrian said voters had turned down arena taxes five times in the past 30 years. But, he said, "there's a fundamental difference between those attempts and this attempt: Those called for an increase in taxes." In this deal, Franklin County and Columbus would pledge up to a third of the tax revenue they are due from the state's four casinos through 2039 to finance the $42.5 million purchase of the arena from Nationwide Realty Investors and to pay to operate it, the newspaper said. Nationwide would invest $52 million in the Blue Jackets and would take a 30 percent ownership interest in the team. It would pay the team $28.5 million over 10 years for naming rights to the arena. The Blue Jackets have said they are losing $10 million to $12 million per year on their lease deal with Nationwide. Rosenberger's panel had begun pursuing a public purchase of the arena so the lease could be changed after Blue Jackets majority owner John P. McConnell said he'd consider moving the team if the lease deal is not reworked. The Dispatch said the deal is expected to save the team $9.5 million a year. Blue Jackets President Mike Priest issued a statement praising the proposal: "This report offers a solution that will provide a long-term sustainable business model for the organization. We are encouraged by the report's findings." The deal would need the approval of the Columbus City Council, the Franklin County commissioners and the Convention Facilities Authority's 11-member board. Rosenberger said he, Dorrian and Jennison had met individually with members of all three groups and that he's optimistic. The $42.5 million purchase price for the arena is slightly lower than the $44 million value Nationwide placed on it during court proceedings to set the taxable value of the building in 2006, a case in which it was in the company's interest to set the price as low as possible. The county auditor had valued the arena at $129.7 million. It cost $147.1 million to build in 1999, Nationwide said. Now, Nationwide would loan the facilities authority $43.3 million for the arena purchase at 4.875 percent interest for 27 years. Nationwide also would agree to take its payments as casino money comes in. If more money than expected comes in, the loan would be paid off faster. If less, the loan would be extended. The state of Ohio would help with the purchase through a one percent, $10 million loan, half of which could be forgiven by the state if the Blue Jackets meet payroll goals. The facilities authority needs a total of $53.3 million in 2012 to pay the purchase price, operate the arena and take care of other contingencies, Jennison said. Rosenberger and others estimate that Franklin County will take in about $12 million per year in casino tax revenue and Columbus $18 million. That's less than earlier estimates. Under the deal, each would pledge a quarter of its casino revenue to retire the debt and operate the arena starting in 2013. After three years, the percentage would rise by one percent each year for seven years and top out at 32 percent in 2022. Nationwide also would continue payments to Columbus schools of $1 million per year into 2015, Rosenberger said. The company agreed to make the payments to make up for a tax abatement on the arena property. But when that agreement ends in 2015, with the arena owned by a public agency, those payments would end and the schools would receive almost nothing, Jennison said. The arena currently pays no property taxes to other agencies because of the abatement. Columbus' casino is under construction and developer Penn National Gaming plans to open it in late 2012. Penn National had planned to build the casino in the Arena District, but business and government leaders, including Coleman and executives at Nationwide and Dispatch Printing, pursued a successful ballot issue last year to move the casino to Franklin Township. The casino is to be annexed into Columbus. Columbus, Ohio - The Columbus City Council approved using casino money to purchase Nationwide Arena, the Columbus Dispatch reported. The vote authorized Mayor Michael B. Coleman to pledge a growing share of the city's casino tax revenue to help the Franklin County Convention Facilities Authority purchase Nationwide Arena for $42.5 million, and to pay millions more to operate the arena through 2039. The agreement allows the city and Franklin County to pay off the loans on the arena early if casino revenue comes in higher than expected, Dorrian said, but to pay back the loans more slowly if the revenue is lower. Lawyers still are drafting the details of the agreement, City Attorney Richard C. Pfeiffer told the newspaper, but the legislation that the council approved authorizes the mayor to commit the city to paying 25 percent of its casino tax revenue in 2013, growing to 32 percent in 2039. County commissioners are expected to vote on identical terms in November after the agreement is drafted, said Bill Jennison, director of the Convention Facilities Authority. The deal as described earlier would move the arena from an ownership group led by Nationwide and into the hands of the facilities authority. Nationwide would invest more than $52 million in the Blue Jackets, becoming a 30 percent owner of the team, and buy naming rights to the arena. The Blue Jackets have said they are losing $10 million to $12 million per year on their lease deal with Nationwide. Blue Jackets majority owner John P. McConnell said he'd consider moving the team if the lease deal is not reworked. Franklin County has approved spending $42.5 million to purchase Nationwide Arena using money coming from a proposed casino. The Columbus Dispatch said the county also agreed to spend $92 million to fund capital improvements for the arena through 2039. Attorneys for Nationwide, the NHL Blue Jackets and the Franklin County Convention Facilities Authority are still reviewing documents for the purchase, which is expected to be finalized in January. 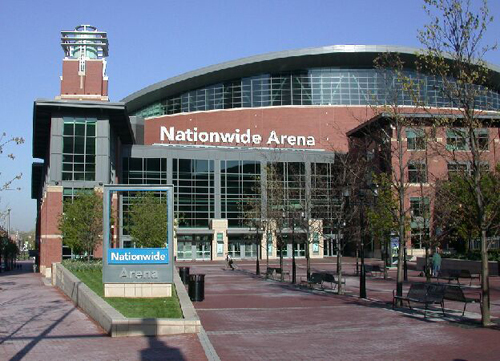 Columbus, Ohio - The Franklin County Convention Facilities Authority closed on its acquisition of Nationwide Arena in a $42.5 million deal that will be financed with up to a third of the casino tax revenue due to Columbus and Franklin County, according to the Columbus Dispatch. With maintenance, operating and debt service costs, arena ownership is expected to cost the city and county more than $250 million through 2039. The deal is expected to save the struggling Blue Jackets $9.5 million per year through a rent-free lease with the authority. Nationwide, the former majority owner of the arena, agreed to invest $52 million in the Blue Jackets to take a 30 percent ownership interest in the team. It also will pay the team $28.5 million over 10 years for naming rights to the arena. The Blue Jackets have said since 2009 that they are losing money, in part because of an unfavorable lease deal with the arena's former owners. Team officials had discussed the possibility of moving the team. The Blue Jackets are finishing their season at the bottom of the league. City and county officials have said that their decision to buy the arena wasn't about hockey; it was about protecting the Arena District that sprang up around Nationwide Arena after it opened in 2000. What was an empty landscape dominated by a closed, decaying prison is now home to apartments, condominiums, restaurants and offices. Nearly 10,000 people work there. The deal was announced in September and took nearly six months to complete. The city and county payments for the mortgage, maintenance and operations are to begin on Jan. 1. They are each on the hook for a percentage of their casino tax revenue through 2039, starting with 25 percent in 2013 and topping out at 32 percent in 2022. The team has agreed to remain in Columbus through 2039. Columbus, Ohio - Mayor Michael B. Coleman has told the NBA that Columbus wants a basketball team now that the ink is dry on the public purchase of Nationwide Arena. The Columbus Dispatch said Coleman sent NBA Commissioner David Stern a letter expressing the city's desire to move a franchise or add a new team if the league expands. "Up until recently, our arena situation was not stable," Coleman spokesman Dan Williamson said. "Now that that changed, the mayor felt it was time to position ourselves to be on the NBA's radar. The NBA needs to know more about us, so he has had conversations with NBA officials." Major obstacles to getting an NBA team include working out how it would coexist with the Blue Jackets hockey team, finding the money needed to land a team and distinguishing Columbus from other cities that want one. "At the moment, we have no plans to expand, and no teams have applied for relocation, so it wouldn't be prudent to comment on the possibilities of another market," said Tim Frank, vice president of communications for the NBA. Stern has said that league expansion is not an option. That means Columbus would have to lure a team from another city. The Dispatch said the most-viable option appears to be the Sacramento Kings. Stern signaled a few weeks ago that he would not stand in the way if the Kings' owners, the Maloof family, decided to relocate. Cleveland Cavaliers owner Dan Gilbert said he would "have to think about" whether the Cavs would stand in the way of a franchise so close to home. "I haven't even studied the demographics of Columbus to know if they could handle two sports teams," he said. An NBA team would be a big win for the city, which, along with Franklin County, agreed late last year to purchase Nationwide Arena for $42.5 million. In his letter to the NBA, which the Dispatch obtained through a public-records request, Coleman makes a case for the city by saying the arena is "on sound financial footing" and that Columbus has a growing population, the lowest unemployment rate in the state and is home to 15 Fortune 1,000 and five Fortune 500 companies. He ends the two-page letter with: "Columbus has demonstrated it has the fan and corporate support to make an NBA franchise successful. I hope to continue to engage you and your office about bringing an NBA team to Columbus, and I look forward to our continued dialogue." Bill Jennison, the executive director of the Franklin County Convention Facilities Authority, which now owns and operates the arena, said having an NBA team is manageable. "The facility could easily be modified or adapted to handle two tenants," he said. "And we play basketball and hockey in there now." Seven NBA teams play in cities with smaller metropolitan populations: Charlotte, Indianapolis, Memphis, Milwaukee, New Orleans, Oklahoma City and Salt Lake City.